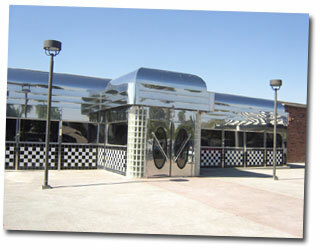 We sell the famous Great American Classic Stainless Steel 50's modular diner! We provide the highest quality construction and over 50 years of diner manufacturing experience. Diner sales to Canada, Mexico, Panama, England, United Kingdom, UK, Germany, Italy, France, Greece, Japan, Hong Kong, China, Australia, Taiwan, South Korea, Sweden, Switzerland, Russia, Poland, Australia, New Zealand, Belize, Ireland, Netherlands, Spain,Belgium, Ecuador, Phillippines, Denmark, Indonesia, Portugal, etc.. If you currently own, or are considering a conventionally built diner or restaurant, give us the opportunity to present our modular diner construction. Whether it's a restaurant, stainless steel diner, convenience store, etc., we can probably get it for you faster, with less hassle and at a total lower cost! Buying a Stainless Steel Diner has never been easier. Dinermite Diners is the leading manufacturer in modular classic stainless steel diners and is based in Atlanta Georgia. Our modular design offers a lower cost and easy location or relocation in the future. View our DINER INSTALLATION page to see how we ship and set up your NEW stainless steel diner. Click here to view diner installation Gallery. 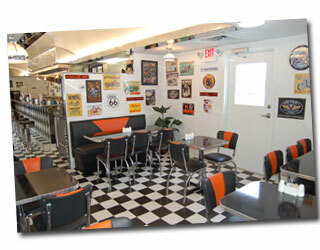 You may view our New Diners for Sale page for more 50's diner sales information. You can see the quality in our diner images and why we have been the leader in United States Diner Sales for over 50 years now. 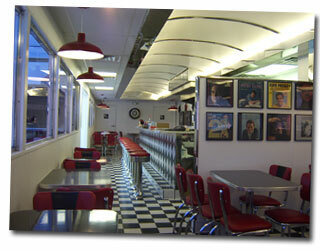 Please view all of our different diner models and call us with any questions or specific diner design needs. Thank you for visiting dinermite.com; your diner sales company.